Can’t see much, can you? 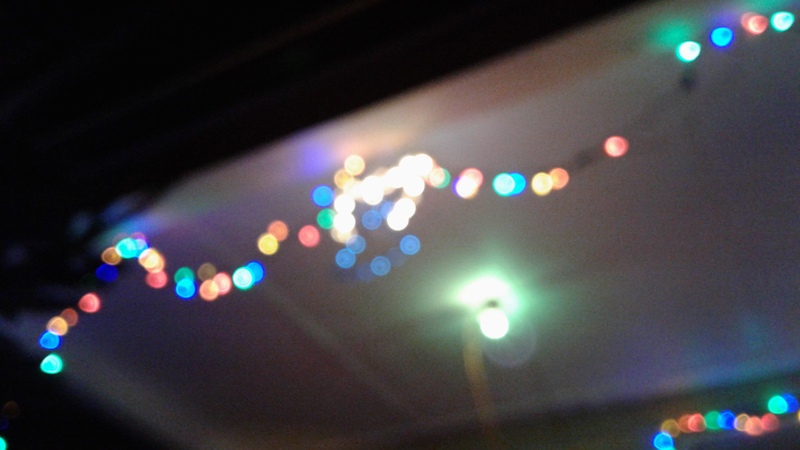 This is not a current picture of my front porch, although said porch is lit up as I type. This is a picture from last year. I’ll try to get out and take a picture sometime this week, so we can compare/contrast. I’m afraid today is Tired Tuesday, or as I sometimes call it Itsonlyfreakin Tuesday (only I don’t always say “freak”). It is not so bad to be back at work, but I think the amount of dust in the air is what is making my sinuses to miserable. Sorry, I didn’t mean to make it Whiny Baby Tuesday. 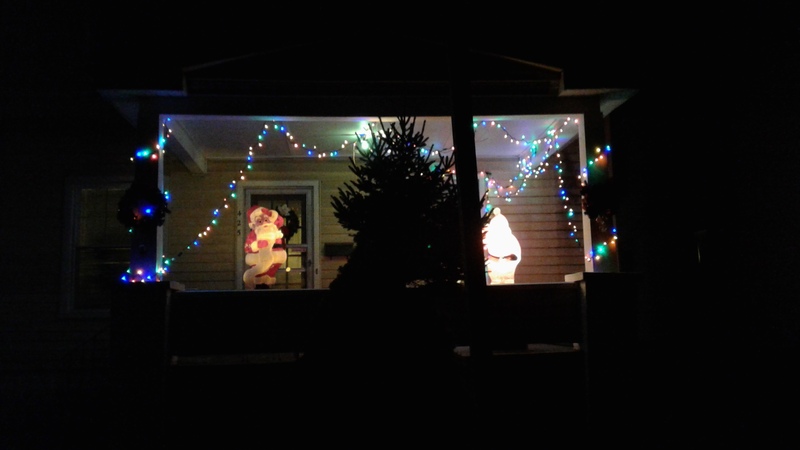 I was quite happy to find out that my lovely husband Steven had gotten our front porch decorated. According to WKTV’s Jill Reale, today was the operative day to do so. Steven said it was still quite cold when he was working on it, but he did not want to put it off till later. At least it wasn’t raining. My bunions say it may rain tomorrow. They are at least as accurate as your average meteorologist. This is the merest fraction of our Santa Claus collection. Inside our house is not decorated yet, but I reach into my Media Library to give you a preview of coming attractions. We like Santa Claus. 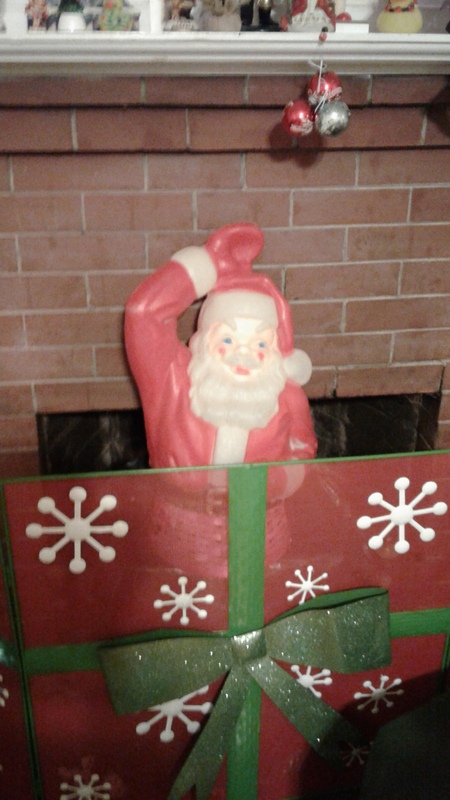 And here is a close up of our best Santa, a present from my Mom, who found him at a second-hand store. How I love a vintage Santa! So this post is short on substance but long on Santa — ooh, what a good title! For all I keep promising better blog posts, the slump continues. I actually tried to write something today, but it just would not come off my pen. I hope my kindly readers will forgive me. At least the pictures are fun. Happy Tuesday, everyone. 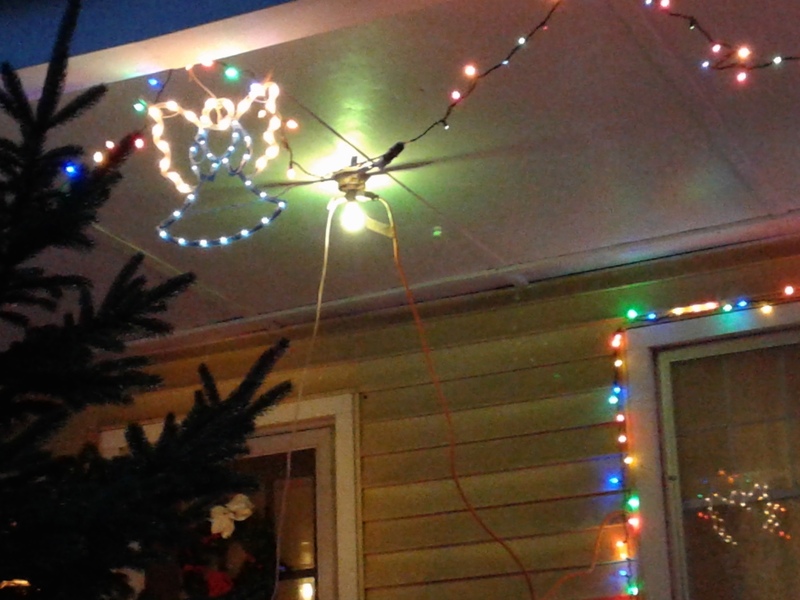 Posted in humor, personal, Tired Tuesday and tagged blog post, Christmas, Christmas decorations, front porch, Jill Reale, pictures, porch, Santa Claus, tired, weather, WKTV, WKTV Weather. Bookmark the permalink. My house is back online, just in time for Wuss-out Wednesday. Instead of sitting at Basloe Library (a perfectly wonderful place to be, but I have to wear a bra and shoes ) I am lounged on my couch. But it is still Wuss-out Wednesday. My brain is dead. My body is not doing much better, but my purpose is not to complain but to blog, possibly to entertain. At least I may entertain myself. That’s something. Steven is watching The Year Without a Santa Claus. Yay, Snow Miser and Heat Miser! Did anybody here Big Bad Voodoo Daddy’s cover of their song? An awesome rendition. However, I have a few problems with this special. I guess I could do worse for a Wuss-out Wednesday post than mention them. A friend pointed out that the whole plot is a little shaky. The two elves go in search of Christmas spirit so Santa will not take the day off. Then the mayor says if it will snow, he will get all the mayors together and give Santa… the day off! I gotta say what I say when confronted with a plot hole in a cheesy horror movie: Waaaaait a minute! My first problem happens before the elves take off, though. Mrs. Claus has the wonderful song, “Anyone Can Be Santa Claus,” her first plan being to impersonate the fat man herself. I quite frankly thought (the first time I saw it, and I still think it) that this is a marvelous idea. Of course anyone can be Santa Claus! All you have to do is give somebody something! EVERYBODY should be Santa Claus! But, no, Mrs. Claus is shot down almost immediately. SHE can’t be Santa Claus. Only the REAL Santa Claus will do. Now don’t tell me it would have been a shorter story if Mrs. Claus had just delivered the toys. They could have put in a lot of twists and turns if they had gone with that plot line. No, I’m not going to write it. If you can’t think of any twists and turns yourself, just take my word for it. Well I won’t wax philosophical about that tonight (regular readers know that half-baked philosophy belongs on Lame Post Friday). I’ll just enjoy the fun music and charming animation (so retro), while I ponder the Christmas spirit. I hope you are all having a lovely December so far. Posted in commentary, humor, personal, Wuss Out Wednesday and tagged Basloe Library, blog post, Boris Karloff, Christmas, Christmas specials, Christmas spirit, computer, half-baked philosophy, library, Mrs. Claus, online, presents, Santa Claus, the Grinch, The Year Without a Santa Claus. Bookmark the permalink. 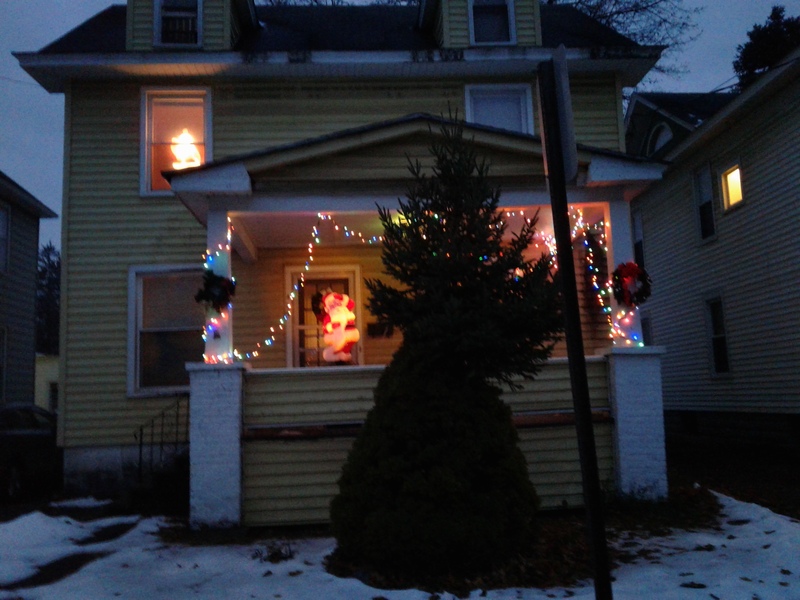 Steven spent his day off making our house look beautiful for Christmas. I thought in lieu of a Non-Sequitur Thursday, I would share a few pictures. First a few Santas. We love Santa Claus. 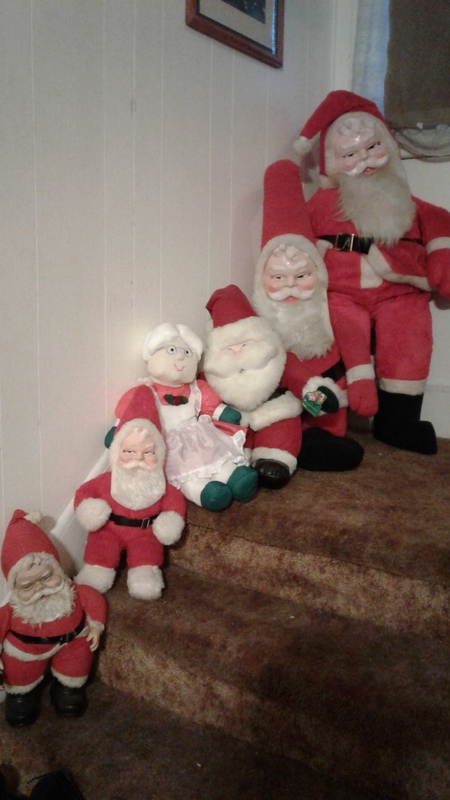 There are stories behind each Santa on the stairs, but I’d like to tell you about our new Santa, or rather half Santa. 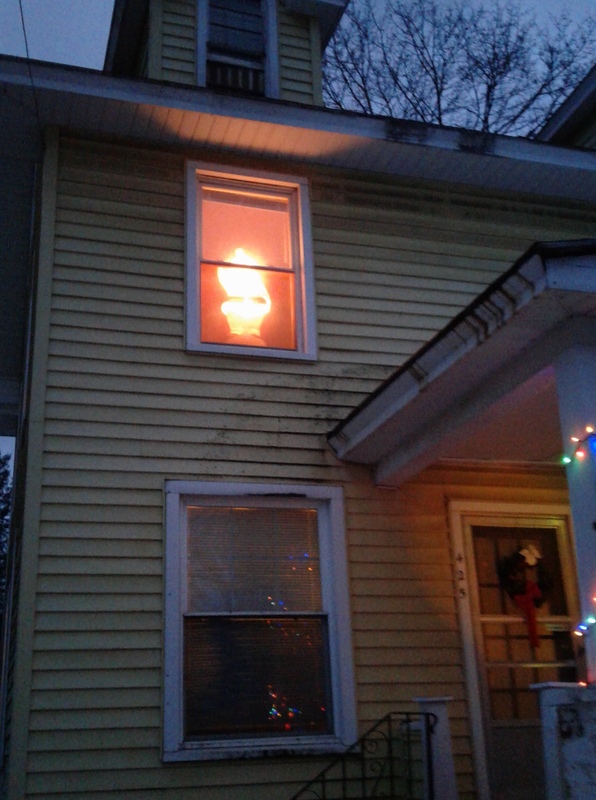 Recently when I was at the Herkimer County Historical Society to talk about a murder mystery, I noticed the top half of a plastic Santa. “He’s yours,” said one of the ladies I was there to meet. 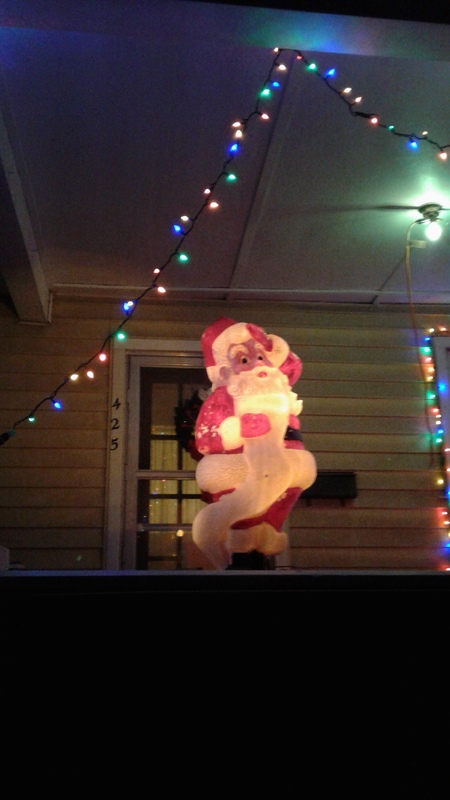 The Santa had been rescued from the middle of the street during a wind storm last winter. They put his picture on Facebook, so the owner could claim him. Steven commented that if nobody did, we could offer the Santa a home. Since he lacks a bottom half, we put him behind our fireplace screen (a Christmas present from my parents a few years ago), so he could look as if he is emerging from the chimney. 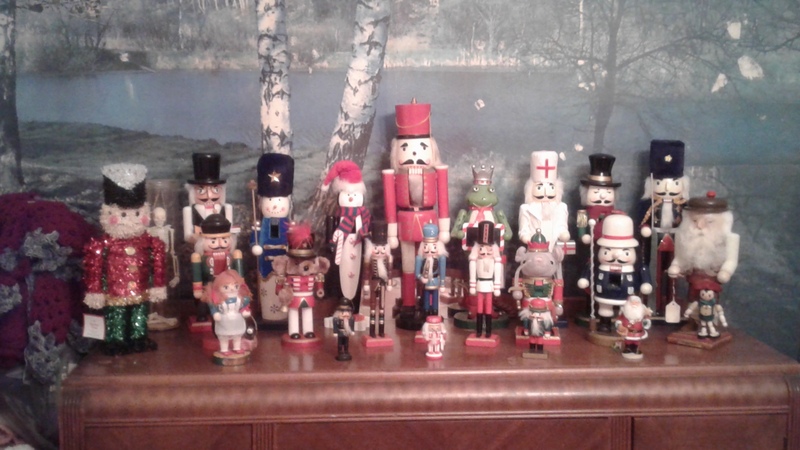 Another favorite feature of our holiday decorations is Steven’s nutcracker collection. This isn’t the whole thing, but a nice selection to cover our buffet. Oh, how I love Christmas. Soon I must finish my Christmas shopping, start my Christmas baking, address my Christmas cards and commence my Christmas wrapping. It is the time of year when I cease to be the Evil Woman CinCin and become… wait for it… Cindy Claus! Posted in humor, personal, Uncategorized and tagged Christmas, Christmas decorations, Non Sequitur Thursday, nutcrackers, Santa Claus, Steven. Bookmark the permalink. I said once before, when in doubt, take a couple of pictures. Or words to that effect. So tonight after staring are the blank screen for a while, I decided to follow my own advice. Um, just as a side note, I did write today, just not a blog post. 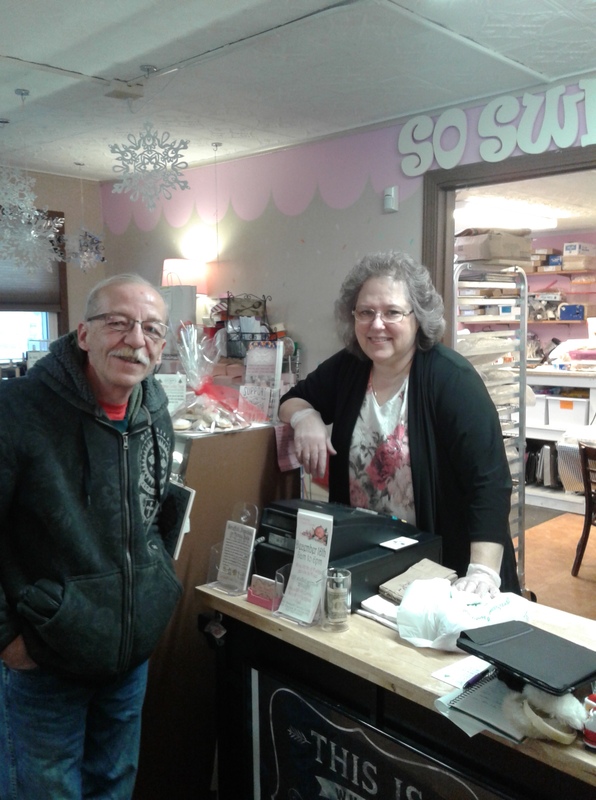 I worked on the murder mystery I am writing as a fundraiser for the Herkimer County Historical Society. Ooh, I should write a blog post about that. Maybe tomorrow. Tonight, I went out and took a couple of pictures. 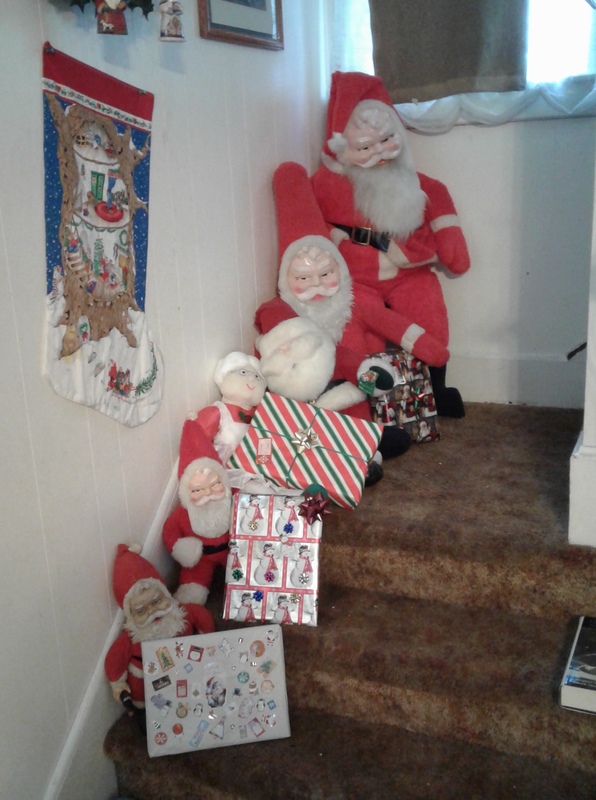 I moved closer to get better shots of our Santa Clauses. This is our new one, who is actually kind of old. My parents got him for us at a second hand store. 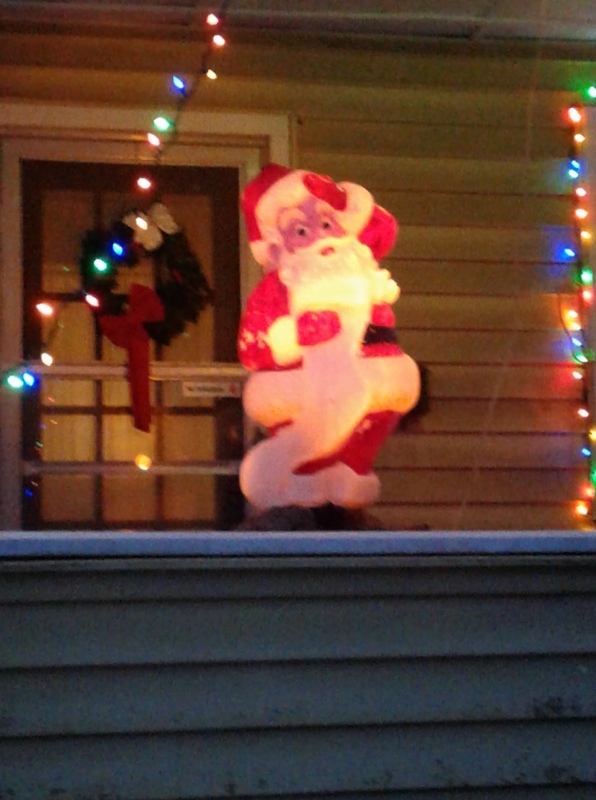 I couldn’t get a good picture of our other Santa, who I purchased at a boring big-box store in 2005, our first Christmas in this house (you know, we ought to give our house a name, so I could refer to it by that in such a case). I couldn’t get a good picture of our angel, either, but I thought the bad one I got might look kind of cool. What do you think? Oh well, maybe not. In any case, here is my post for today. My usual nonsense with a few pictures thrown in. I think they class it up a little, but perhaps I flatter myself. I guess I’ll call it a Mental Meanderings Monday and drive on. Hope to see you on Tired Tuesday. Posted in humor, Monday Mental Meanderings, personal and tagged blog post, blogging, Christmas, Christmas decorations, pictures, Santa Claus, writing. Bookmark the permalink.